Senator Al Franken (D-MN) stated on January 26 that none of the 48 Democratic caucus senators would vote for DeVos. Meanwhile, two GOP senators, Susan Collins (ME) and Lisa Murkowski (AK), have announced they will vote against the nominee. 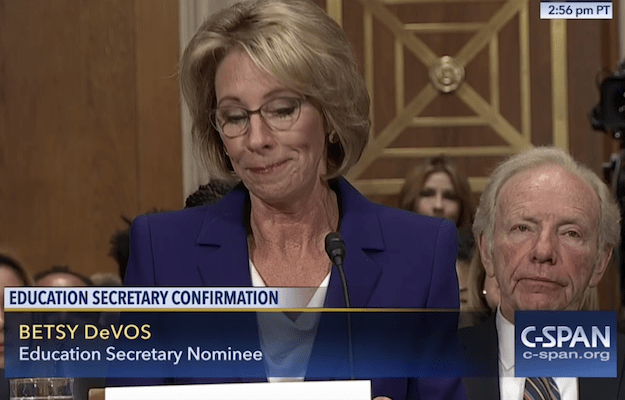 Both sit on the Senate Health Education Pensions & Labor Committee, which held DeVos's nomination hearing, at which she demonstrated minimal understanding of bedrock education issues and offered only weak support for public schools. Murkowski noted that she had received "thousands, truly thousands, of Alaskans who shared their concerns about Mrs. DeVos as secretary of education." But the GOP is still in a position to prevail, because Senator Jeff Sessions (R-AL) is hanging on to his seat and voting, rather than proceeding with his own vote to be Trump's attorney general, or recusing, and that could get them to 50 votes for DeVos. Vice President Pence could then break the tie. Democrats are fighting. "Just one more Republican, that's all we need," Senator Elizabeth Warren (D-MA), stressed on the floor this afternoon. "Citizens... are outraged by this nomination." Former White House government ethics lawyers Norman Eisen (Obama) and Richard Painter (George W. Bush) today offered another emphatic argument against DeVos: "Seldom have we seen a worse cabinet-level ethics mess than that presented by Betsy DeVos... Her extensive financial holdings present significant--and unresolved--conflict of interest issues. She also failed to provide the Senate with accurate information about her involvement with outside organizations. We have regretfully come to the conclusion that these concerns disqualify DeVos for that cabinet position." But there is a well-financed effort to force DeVos, a major donor to GOP and conservative causes, into office over all this the opposition. It includes new TV ads from the right-wing Club for Growth, pressuring red-state Democratic senators Heidi Heitkamp (ND) and Joe Manchin (WV). Another operation pushing for DeVos is the well-established conservative think tank the American Enterprise Institute (AEI). In pieces published on the AEI website on in December and January, AEI's Director of Education Policy Studies, Frederick Hess, railed against the tone of attacks on DeVos. He also included an important disclosure: That DeVos was a member of the AEI Board of Trustees. This morning, AEI published a new piece, this time by Jason Delisle, a resident fellow there. This time there is no disclosure of DeVos's association with AEI. The think tank no longer lists her as a board member. But readers might still want to know that she was a donor and on the AEI board until last month. Worse, the Delisle essay, seeking to vindicate the hapless DeVos, purports to tick off a series of alleged Obama Education Department missteps, which Delisle concludes add up to "less-than-elegant higher education policymaking." But Deslisle's narrative is misleading on multiple fronts. "Midway through President Obama's first term, the Department of Education launched an effort to clarify a law governing which for-profit colleges could receive federal student aid. According to statute, programs at proprietary schools are supposed to provide credentials to students that ultimately lead to "gainful employment," but those terms were never explicitly defined. In response, the Obama administration developed a complicated, multi-pronged regulation that defined gainful employment largely around students' debt-to-income ratios after leaving school." "There was one big problem: The administration did not take the time to research an appropriate debt-to-income ratio or develop a defensible rationale for what would signal gainful employment. Instead, they simply picked a threshold that would disqualify 25% of programs at for-profit colleges. In other words, the administration started with the goal of shutting down one in four programs and worked backwards to set its standard. There are laws against arbitrary regulations like that, and a judge issued an embarrassing rebuke to the Obama administration." Delisle then pastes in a quote from that judicial opinion, which was issued by U.S. District Judge Rudolph Contreras in July 2012. Delisle's discussion of the gainful employment rule is deceptive. Judge Contreras did void the initial rule, finding that the Administration had failed to provide an adequate rationale for one component, but he upheld several aspects of it. More importantly, the Obama Administration promptly engaged in a second rule-making process, which produced a 2014 final rule that was then upheld by two federal district court judges and by a unanimous panel of the US Court of Appeals for the District of Columbia Circuit. The rule is now in effect. It penalizes some career college programs that -- because they are overpriced and sometimes of poor quality -- consistently leave graduates with debt they cannot afford to repay. The rule thereby helps protect both students and taxpayers from predatory abuses, especially at for-profit colleges, who represent 98 percent of the programs that flunked the first round of the test. This AEI paper omits this important information. By the way, instead of mocking this effort, AEI should be in favor of a rule that fights waste, fraud, and abuse with taxpayer dollars; many for-profit schools get 90 percent or more of their revenue from the US government. As the appeals court wrote: "It would be a perverse system that, by design, wasted taxpayer money in order to impose crippling, credit-destroying debt on lower-income students and graduates." A guy on Twitter responded to my early-morning tweet on this point: "did you read article? He was describing the blunders. Even Obama would agree 1st GE attempt was a blunder." But AEI's description of what happened with gainful employment was like ending a discussion of last night's Super Bowl with Atlanta leading 28-3 and calling the game a blunder by the Patriots. Delisle's invocation of gainful employment to defend DeVos is appropriate in another sense, however: Amid a series of vague answers at her hearing, DeVos provided relative clarity on one point -- she cast strong doubt on the appropriateness of the gainful employment rule, adding to the clues that the Trump Administration is planning to dump the regulation. DeVos's partner in dismantling accountability measures for colleges, apparently, would be Jerry Falwell, Jr., the president of Liberty University. Falwell says he will lead a new a new Trump task force, whose mandate will include rolling back regulations on colleges. Allowing Falwell to shape accountability measures governing schools like Liberty would be like the fox guarding the henhouse, and the same kinds of concerns apply to DeVos, who has been an investor in a range of for-profit education companies. Salivating over the prospect of pleasing their wealthy donors in the for-profit college industry, Republicans in Congress are moving ahead with efforts to block the gainful employment rule, ignoring the pleas of advocates for students, including the numerous veterans groups who reaffirmed in a letter last week that they want to protect this rule and other accountability measures. Most of the opposition to DeVos is focused on her views and lack of knowledge regarding K-12 education. But AEI's deceptive defense of the nominee is a good reminder that there also is much at stake on the issue of accountability for the predatory colleges who have abused students, ripped off taxpayers -- and corrupted policy debate in Washington. UPDATE 02-07-17 : AEI's Jason Delisle posted a response to my comment on his article: "Yes, the administration did successfully develop a standard that eventually survived the courts. Did not mean to suggest the opposite. There was a line about that in an earlier version of this piece that mistakenly got dropped in editing and didn't appear here. No deception was intended." His piece was updated to note that the Obama Administration issued a new gainful employment rule that was upheld. Also, AEI added two notes: (1) "Update, Feb. 6, 2017: AEI has received general fund donations from the DeVos family foundations. AEI operates independently of any political party and has no institutional positions. Our scholars' conclusions are fueled by rigorous, data-driven research and broad-ranging evidence. More information on AEI research integrity policies can be found here." (2) "Update, Feb. 7, 2017: The fifth sentence in paragraph two in the section "Gainful employment" was belatedly added by the author."